The fine art of Writing nay “Plugging”!!! Just realized that this is my 50th post 🙂 🙂 On the New Year eve in Dec 2011 when I wrote my 1st piece, my endeavour was just to populate my WordPress blog account which was dormant with atleast 1 post. As I sit to write this one, I thank all of you who read, who comment, who like, who share, who re-tweet, who favourite in short who encourage my writing. Without this oxygen I wouldn’t have dared to continue. I can say now that this was one “New Year resolution” which stood the test of time!!! Thank you once again. For a long time I’ve been fascinated by writers and writings mostly of the non-fiction type. I would think most of my generation has been. There was a time as a student, reading the ‘Hindu’ newspaper from the masthead to the “Printed and published by…” line was a daily karma and its phala were few. Apart from updating you on the current affairs and general knowledge it helped in brushing up the language. I refer to all this in past tense the reason for which you will realize by the end of this piece. New Delhi: Mobile phone users have a lot to cheer about this festive season. It’s raining freebies and discounts on phone buys as well as internet data charges. And with the Diwali weekend coming up, the pitch may get stronger. One of the most attractive offers comes from Anil Ambani-owned RCom. The operator is offering the latest Apple iPhones, 5C and 5S, at never-heard-before prices. RCom will give you the 16 GB versions of the devices without any down payment. The 5C will cost you Rs 2,500 per month for two years and the 5S Rs 2,850. This payment comes bundled with free unlimited calls and SMSes (local and STD across network), apart from zero cost for 3G data usage. There is also no charge on national roaming. There is a down payment though for higher versions of the two devices, 32 GB and 64 GB. Sony, which is also expanding in the Indian mobile phone market, is offering free limited-period 3G data packs as well as other accessories along with its premium Xperia Z range of phones. One read of the above piece will tell any reader that this so called “news” item has no news value and it is purely a “marketing plug” for one of the mobile phone vendors. I am certain that this is paid content masked and carried under the garb of a news item. And to feature this in the front page brings me to the topic of this piece which is – Has the fine art of writing given way to the fine art of “plugging”??? It seems absolutely so. News in its conventional old world form is supposed to be “Neutral, Objective and Fair”. The joke those days on ‘The Hindu’ reporting used to be that even if there was a murder right in front of the office of that newspaper on broad day light they will not report the same till the FIR is filed and the police confirms so 🙂 Well the joke was almost true for ‘The Hindu’ and many newspapers those days. But today it seems in the age of “competitive journalism” and “struggle of existence” of the media, “survival of the smartest” is the mantra and if that means blurring the lines of news and paid views so be it. 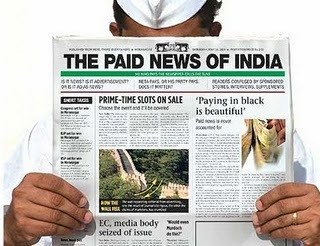 So there are news items, news plugs, columns, plugged columns, editorials, advertorial, paid news…,… The challenge before the common reader is to distinguish one from the other. Again a few days back in the TOI I read a piece about the virtues of “Natural Mithai” with a head line – “Adulteration prompts housewives to prepare sweetmeats at home”. In the middle of the festive season it seemed to be a pretty innocuous and timely piece till one saw an advt. in the same paper few pages away for ‘Himalaya fresh’ sweets – which promised “Freedom from Adulteration” as its caption!!! It’s not my brief to trash the ‘Old lady from Boribunder – The Times of India’ in this piece. I think the muck is widespread and there are very few media exceptions these days. But certainly Bennett and Colman the publisher of TOI has been a torch-bearer in this front. In fact reportedly one of its owners mentioned that they are in the business of “Space” and not “News”. Ergo they came up with an innovation called “Medianet” which basically carries ads masquerading as news with a “blink and you will miss” footnote that it is an ad. So when the film ‘Chennai Express’ is about to be released you will find plugs which will say “lungis are today’s fashion statement”, or “SRK’s mom is from South”,.. and other puerile stuff like that. The other day I read with interest a piece on how the much maligned “Butter, cheese,.. can be good for heart!!! My 1st instinct was to wonder if it was a plant from Amul, Nestle or Britannia to sell more butter and when I shared this on my timeline in FB I had to do so with a caution akin to “Mutual funds are subject to market risks, please read the offer document carefully before investing”!!! Similarly I routinely get to see how coconut oil is not bad for health one day and why coconut oil must be replaced with other less fatty oils another day depending on who has plugged the item on that day. Moving away from products and marketing, this virus has spread into the political space and threatens to corrupt our democracy. One saw or rather heard in the now infamous ‘Radia tapes’ how corporates were using PR machinery to influence public policy making. Radiagate brought to open the secret which was closely held within interested parties that journalists and so called experts were open to being swayed to take a slant in their columns. As a proof for this, If you have not heard this conversation between Niira Radia, the PR pro and Vir Sanghvi a reputed columnist you must and now. Check this out. Radiagate has driven home the truth that Media Ethics is nothing but an oxymoron. In the world of journalism it is a common practice for reporters, journalists and columnists to rely on PR sources to source news. For a PR pro, pitching his/her story is part of the job. But for the journalist it becomes important to carry out his homework on the pitch and come up with a balanced news piece or article. Therein lies the credibility. As some body said “Quid pro quo norm in journalism has led to poor copy and lazy PR”. The cozy “you scratch my back, I will yours” bond is as old as the profession itself. But I guess what is new is the institutionalized form of plugging products in news items which needs to be watched out for. So today whenever I read some article my first instinct is to check if it is indeed genuine opinionated writing or some prejudiced plugging!!! I guess in today’s schools of journalism the lessons for the fine art of writing would be searched and replaced by the fine art of “plugging”. So if tomorrow one expert journalist writes “for” or “against” Foreign Direct Investment in retail, one has to take that with a fistful of Desi salt!!! The plug could be a “Desi” Reliance one or a “Videshi” Walmart one. 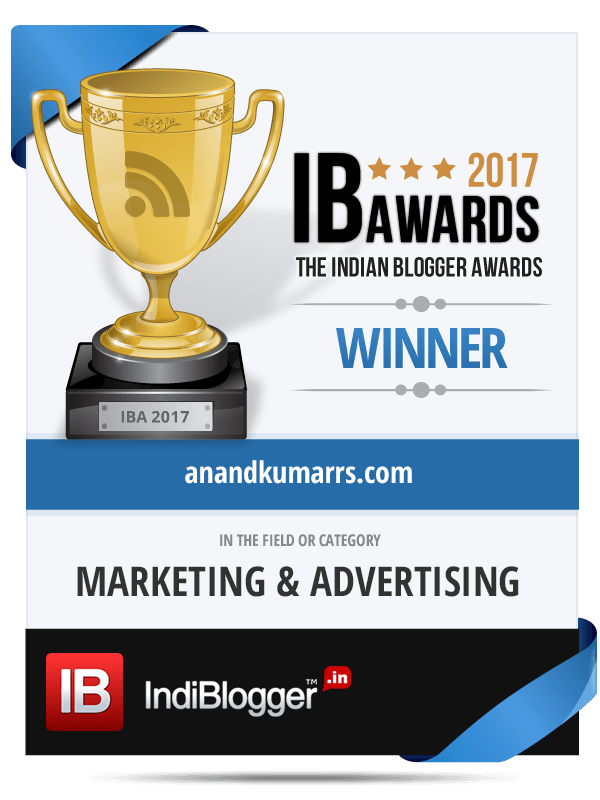 Hi there,I log on to your blog “anandkumarrs” regularly. Your humoristic style is bravo, keep up the good work! Hi,I saw your blog “The fine art of Writing nay “Plugging”!!! | anandkumarrs”. Your humoristic style is witty, keep doing what you`re doing! Congrats Anand on your 50th post. Go ahead and keep writing.All the best. Every topic is written interestingly and is a good read. Hi Bindu, Thanks a lot for those words. wonderful….am glad u gave wonderful shape to what many could occassionally ‘feel’ but couldnt infer anything further…Vey well expressed..Educative! Hey PSK, Thanks and glad you liked it. It is all a question of Medianomics — earlier companies / brands advertised and thats about it, so media made money. Over a period of time as the advertising started to decline — media had to Innovate (these things are INNOVATION) and not to be seen as PLUGS ;-). A Movie, Restaurant, Personality, Programmes are all paid for (Edvetorials) — not advertorial, so you see Innovation again. Media and Ethics — OXYMORON! True, the print and electronic media industry has commercial commitments, fortunately the web is still much free.. Thank you very much Karthik Sir. But well written and very well conversed in terms of simplicity of daily newspaper reading.